January 10, 2019 -- Ultrasound technology developer QT Ultrasound has opened three commercial breast scanning centers that will feature its QTscan breast imaging technology. The centers are in Novato and Walnut Creek, CA, and in Grand Rapids, MI. QT Ultrasound plans to open more centers throughout the year. The U.S. Food and Drug Administration (FDA) cleared QTscan in June 2017. 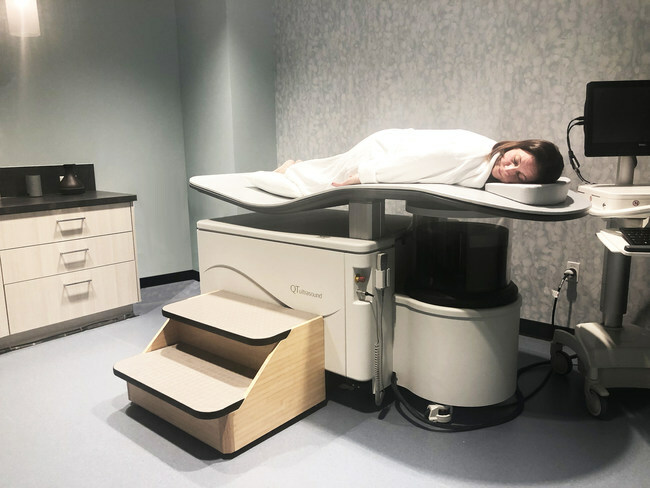 The scanner is radiation-free and compression-free, and it is especially effective for women with dense breasts, according to the firm. It is not a replacement for mammography, the company said; it is intended for women who may have received a false positive on mammography or who have been told they need additional breast screening, such as young women at high risk for breast cancer.